Mystery Photo No. 48 was actually a photograph of a newspaper cutting. It recounted how a senior RAN officer was sent as an ‘invisible man’ to study the Spanish Navy’s aircraft carrier of the time. For political reasons his visit was unofficial. The ‘invisible officer’ assured us that the trip to Spain did happen and the newspaper report was accurate. Who was the invisible officer? What was the context of the visit? HMAS Melbourne was the second of the two Majestic Class carriers the Australians bought off the British in the late 40s. Unlike the first (HMAS Sydney) she underwent extensive modernisation during the latter years of her construction to fit an angled flight deck, steam catapult and a mirror: and so her delivery was delayed. She finally arrived in Australian waters in 1956 under the command of Captain G.G.O Gatacre, with her new Fairey Gannet and De Havilland Sea Venom aircraft. Over the next 20 years Melbourne did sterling service, but by the mid 70s the question of her replacement was at the forefront of Defence thinking. Several studies had been conducted, including one which examined the utility of a helicopter carrier both as a platform for ASW helicopters and as a fast logistics ship. By mid 1977 the notion of a conventional carrier was fading, and a further study had examined design of a Vertical Short Take Off/Landing platform. In September of 1977 the Minister for Defence, Mr. D.Killen, approved the worldwide issue of an invitation to register interest to assist in project investigations of possible vessels. Sixteen companies responded and Defence decided to narrow its interest to three possible builds: the Italian Garibaldi at 13250 tonnes; the Spanish Sea Control Ship (SCS) at 14,800 tonnes, and the US Amphibious Landing Platform Helicopter (LHA) which, at 39,900 tonnes was about three times the displacement of the other contenders. Within six months two further contenders were added to the list: the British Invincible class (19500 tonnes) and a Vosper Thornycroft design for an 8000 tonne Sea Harrier carrier. In May of 1979 the Defence Force Structure Committee agreed that funded investigations should go ahead on the Garibaldi, Spanish SCS and the US LPH – a late alternative to the LHA. Specifically, Defence was interested in a variant of the Iwa Jima class. 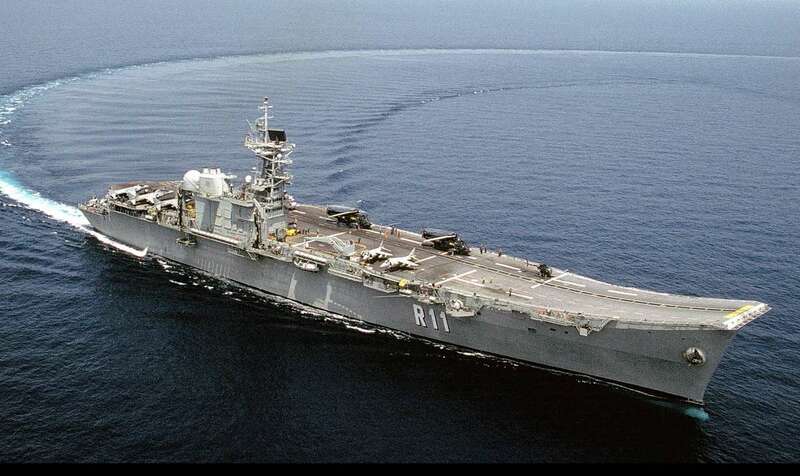 By August 1980 Cabinet had decided to acquire a purpose designed carrier equipped with ASW helicopters but with the potential to operate STOVL aircraft. Further studies into the finalists resulted in the Italian Garaibadi being dropped, and ship characteristics developed for the LPH and SCS – but in July 1981 the UK Ministry of Defence proposed the sale of one of its three Invincible class ships. Minister Killen directed that the option was to be included in the evaluation, with ready availability and the likely cost being important factors in influencing this decision. The Mystery Photo newspaper cutting (above) reported on part of the process. The Australian Government was keen to find out more about the Spanish carrier but a spat over meat exports had resulted in a ban on negotiating any Defence procurement from the EU, or even countries likely to join the Union. 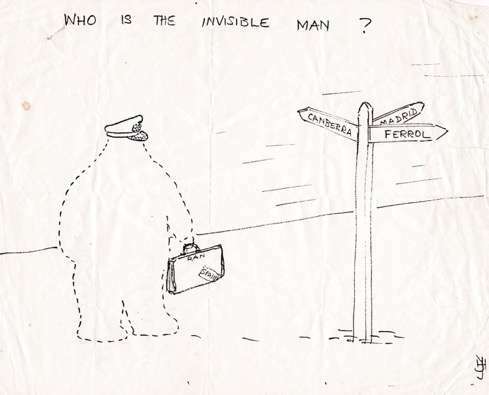 The answer was to send a very low key delegation to Spain, traveling incognito – hence the “Invisible Man” concept. It was a curious strategy, considering there were publicly funded studies in place which openly cited the SCS as an option. Nevertheless, CDRE Toz Dadswell was dispatched to view the Spanish vessel and report back. A rather dodgy cartoon accompanied the newspaper article, which appeared in the Canberra Times of 4th February 1982. Above: The Spanish Navy ship Principe de Asturias. It’s design was basically that of the initial US Navy’s Sea Control Ship design of the 1970s, modified with a ski-jump ramp added. (Wikipedia). Right. The dodgy Canberra Times cartoon. In the event, it was a wasted mission as the decision to buy HMS Invincible was announced in February 1982. In a detailed statement, Killen advised the delivery would occur in late 1983 at a cost of $285m, with a further $478m for the provision of spares, test and training equipment, necessary modifications and other support. He went on to say that HMAS Melbourne’s refit would be cancelled and it would be paid off as soon as possible to save costs. Importantly, he emphasised that Invincible would only be equipped with ASW helicopters, although the decision whether or not to buy Harriers would be considered later. A copy of his statement, which explains some of the reasoning behind the Government’s decision, can be seen here. History tells us, of course, that the Invincible offer was withdrawn by the Brits following the Falklands War, and that the Liberal Party government lost the election of 1983 in a landslide defeat. One of the first decisions of Bob Hawke’s new Labour Party was to announce that there would be no replacement for HMAS Melbourne. Papers in Australian Maritime Affairs No 4 (RAN Maritime Studies Program) “Australian Carrier Decisions – The acquisition of HMS Ships Albatross, Sydney and Melbourne” by Anthony Wright. June 1998.